And so it is. I do kinda need some advice though first, if that's alright with you. Firstly, I decided to try out the loop stitch on one of my hats. 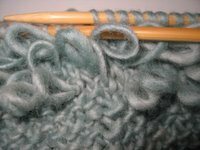 I had this brainwave of an idea using this stitch but of course wanted to try it, and so have started to knit it as a band on another hat. Surprisingly, I've never used this stitch before although I've lusted over it many times, so you can imagine my excitement when an idea pops into my head of a feasible and suitable way of using it. Can anyone else suggest another method for making the loops? I might try purling the ground instead of knitting to see if that makes it tighter. Otherwise, I've drawn a blank and really don't like having my knitting look so untidy. Next up, I found this great pattern for a pixie hat online so thought I'd try it out. It was the shape and structure that fascinated me, so before I could explore this in my own designs, I needed to knit it to get under the skin of the pattern. So I have to say dear pattern writers, IT DIDN'T WORK, this idea of yours. Oh well. I could do with some child sized hats to sell. Now, being as I liked the hat design, I didn't give up. So went for knitting it in Rowan Big Wool with even larger needles, and decided to add extra stitches too. The mitre rib pattern was pretty easy to work out and add extra width to... and if you add extra width you inevitably add extra length. And this time it worked. The main body, excluding the crochet trim took me just under an hour to make - the beauty of super-bulky wool. Mind, I'm not that keen on it as it will show up the slightest mistake or uneveness in tension (which doesn't happen too often, thankfully) I'll stick to chunky or aran, thanks. Still, the simplicity of the structure has given me lots of food for thought, especially from a free pattern point of view - not everyone feels comfortable knitting in the round. Gonna crack on and sort out this loop stitch before I abondon it completely.